The Southern Maryland Blue Crabs announced the team’s coaching staff for the 2019 season today. 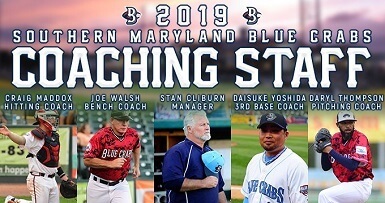 Alongside Blue Crabs’ manager Stan Cliburn, who lead the Blue Crabs to a Freedom Division Championship during the 2015 season, the staff features returning Bench Coach, Joe Walsh, Third Base Coach, Daisuke Yoshida, Player/Hitting Coach Craig Maddox, and Player/Pitching Coach Daryl Thompson. Walsh is set to begin his sixth season with the Blue Crabs in 2019. He serves a unique role in the Blue Crabs franchise, but a cornerstone nonetheless. He connects with the players on a personal level, and has a knack for helping them perfect their craft. Earlier in his career, Walsh worked with various AA and AAA organizations. Yoshida, the Blue Crabs’ 2019 third base coach is no stranger to Regency Furniture Stadium. He spent the 2009 and 2010 season as a utility player for the Blue Crabs. He is also familiar with Stan Cliburn as a manager. The two worked together for the New Britain Bees in 2017 and reunite in Southern Maryland to try to bring the squad back to winning ways. The last time the Blue Crabs appeared in an Atlantic League Championship Series was under Cliburn in 2015. Maddox, a midseason addition to the Blue Crabs last season returns in 2019 in a new role. In addition to being the utility player that he was last year, he will expand his versatility into the coaching realm and serve as the team’s hitting coach. In 2015, Maddox made his Atlantic League debut with the Blue Crabs and would spend the next two years in New Britain before returning back to Southern Maryland this past season. Maddox knows his way around the batters box as he is two seasons removed from a career best .306 batting average. Thompson needs no introduction, his name synonymous with the Blue Crabs. The Southern Maryland native is set to begin his 8thseason with the Blue Crabs, and for the first time in his career will not only be a starting pitcher, but will also serve as the team’s pitching coach. His name will forever be associated with the Atlantic League as the fireballer sits top 10 in league history in innings, wins, and strikeouts. Thompson appeared in the MLB in two seasons, 2008 and 2011.